Democratic Sen. Cory Booker (N.J.) gave $20,000 to the legal expense fund of Sen. Robert Menendez (D., N.J.), who is now on trial for corruption charges, records show. Salomon Melgen, the wealthy Florida doctor prosecutors say had a "corrupt pact" with Menendez, and his wife also donated tens of thousands to a prior legal expense trust that was established by Menendez. Booker appeared at the opening day of the corruption trial last week and sat in the first row behind his Democratic colleague. Booker said he expects "some serious appeals" if his mentor is convicted. "He's innocent until proven guilty. 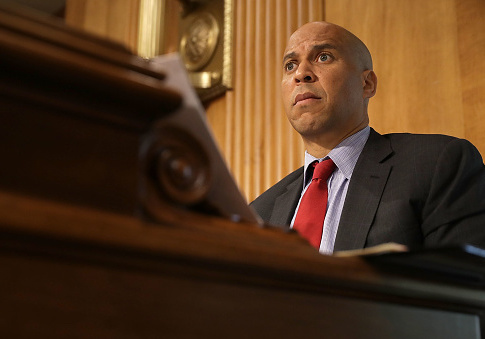 So he is an innocent man," Booker said. "If he's proven guilty, I think there's going to be some serious appeals because I think there are some fundamental constitutional questions that I've never seen in a case like this." Booker's donations are shown in documents obtained by the Washington Free Beacon from the U.S. Senate's office of public records filed by the Robert Menendez Legal Expense Trust, the embattled senator's legal fund. Booker made the contributions to Menendez's legal fund from his own leadership political action committee, which was named CoryPAC at the time of the cash transfers. The first donation from Booker's PAC to Menendez's legal trust was made on Aug 17, 2015, in the amount of $10,000, the maximum amount that can be donated to the legal trust in a calendar year. Booker's second donation was made on March 4, 2016, and was also for $10,000. On April 18, 2016, a little more than a month after the second donation was made, CoryPAC changed its name to Purpose PAC, Federal Election Commission filings show. Booker appears to be the only politician who gave money to Menendez's legal fund, according to a review of all its donors dating back to the beginning of 2014 when the fund was established. PACs that are not tied to any particular politician also made donations to the fund, which has hauled in millions of dollars since its inception. A number of CEOs and real estate developers made contributions to the fund. Liberal billionaire donor Haim Saban and with his wife, Cheryl, who threw millions of dollars behind pro-Clinton PACs during the 2016 presidential election, also gave maxed out donations on numerous occasions. Menendez is facing 12 counts of corruption charges including bribery. Prosecutors have said Menendez had a "corrupt pact" with Dr. Salomon Melgen, a Florida eye doctor, and used his office to benefit Melgen. Menendez took a number of lavish trips on Melgen's private jet to the Dominican Republic. "The defendants' bribery scheme began shortly after Menendez's elevation to the Senate in 2006, when Melgen began a pattern of treating Menendez to weekend and weeklong getaways in the Dominican Republic that would continue for the next several years," prosecutors said in a filing. "For the first four years of the corruption scheme, the all-expense paid trips Melgen provided often included free roundtrip flights on Melgen's private jet for Menendez and his various guests. When the doctor's private jet was unavailable, Melgen supplied equally luxurious travel for the Senator." Melgen has showered past Menendez campaigns with cash and contributed to a previous Menendez legal expense trust called the Fund to Uphold the Constitution, the documents show. The Fund to Uphold the Constitution was established in 2011 to "accept transfers of money, property, and services for the sole purpose of defraying the costs that have been and will be incurred in connection with Committee to Recall Robert Menendez v. Wells." Melgen donated $10,000 to the fund during the third quarter of 2011. The wealthy doctor made another $10,000 donation during the second quarter of 2012. Flor Melgen, Salomon's wife, also gave two separate $10,000 checks to the fund at the same time that Salomon had made his donations. Marc Elias, a partner at the Washington, D.C., Perkins Coie law office, who is considered the "go-to fixer" for Democrats in trouble and who later acted as the top campaign lawyer for failed Democratic presidential candidate Hillary Clinton, submitted the Fund to Uphold the Constitution's termination report in February 2013. The legal trust had taken in $150,000 in contributions from just a handful of donors and spent all of its money, Elias wrote in the letter. The $40,000 in donations from Salomon and Flor Melgen accounted for more than a quarter of all the contributions to the prior fund. Menendez's current legal expense trust was established in January 2014. Menendez was indicted on the corruption charges in April 2015. Prominent Democrat senators have taken campaign cash from Menendez as recently as this year. Six high-ranking Democratic senators accepted tens of thousands from Menendez's PAC between February and June, the Washington Free Beacon reported last week. Sens. Elizabeth Warren (D., Mass. ), Tim Kaine (D., Va.), Debbie Stabenow (D., Mich.), Jon Tester (D., Mont. ), and Chris Murphy (D., Conn.) all took between $5,000 and $10,000 in campaign donations from Menendez. The National Republican Senatorial Committee (NRSC) and a government watchdog group have called on the Democratic senators to return the Menendez campaign cash. Menendez maintains his innocence. "I look forward to proving our innocence and being exonerated," the Democratic senator said before his trial began. Booker's office did not return a request for comment on the donations to Menendez's legal expense trust by press time. This entry was posted in Issues and tagged Bob Menendez, Corruption, Cory Booker, Democratic Donors. Bookmark the permalink.